Question: Does a Modified Bat Knob Increase Bat & Ball Exit Speeds? In this baseball hitting drills for contact bat knob experiment using the Zepp (Labs) Baseball app & Bushnell radar gun , I wanted to use the Scientific Method to analyze what would happen to Bat and Ball Exit Speeds when using the same model and sized wood bat, but the only difference being that one bat has a regular knob, and the other a ProXR knob. A Washington University study found there was a 20% to 25% reduction in compression forces in the hands when using a ProXR technology. My fascination with this all started when Grady Phelan, the Founder and President at ProXR, LLC, wrote this LinkedIn post titled, “Baseball’s Broken Hamate Plague“. After I reached out, Grady was open to the idea of doing a Zepp and Ball Exit Speed baseball hitting drills for contact experiment. “One of the experiments we did early on with ProXR, as part of our due diligence before we went to market, was to measure the compression forces in the hands during a swing. I was fortunate enough to be able to work with some researchers at Washington University School of Medicine, Bio-Mechanics lab here in St. Louis. We connected a conventional bat and a ProXR bat to digital pressure sensors and had a batter take some swings. We were able to dial into the area of the hypothenar (the heal of your hand below your pinky) and compare the difference in compression. 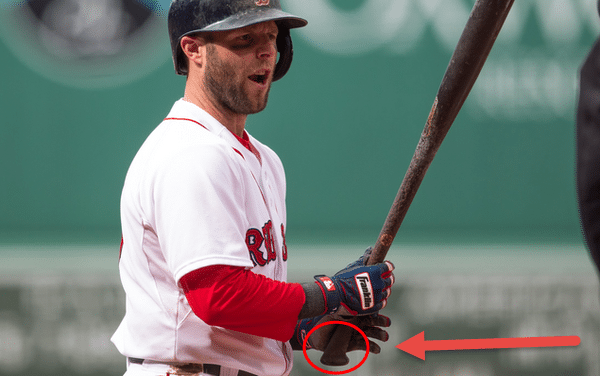 “Pedroia is actually using something called an axe that is being put on a Victus bat. There is some minor confusion in the market given the axe’s similar look with ProXR. Here’s the top-line difference between ProXR and the Baden product: if you’ve ever swung an actual axe (chopping wood), which the Baden product is based on, you know that the swing path is linear, meaning it drives the hands to the point of contact AND (this is probably the most important point) the swing ends at contact. This is critical. The oval shape of an axe handle and the general configuration of the axe handle evolved over thousands of years specifically to drive the axe head to the point of contact (this also applies to swords, hammers and other linear-path swing implements). The oval shape locks the hands into alignment with the swing path and PREVENTS the hands from deviating from that swing path. In sharp contrast, you know a baseball swing is rotational – meaning the bat must fully rotate around the batters body and the hands MUST roll over the central axis of the bat to compete the swing. This gives hitter the ability to both, make adjustments during the swing and complete the rotational swing path. Putting an oval axe handle on a baseball bat is counter-intuitive to the requirements of a rotational baseball swing. Imagine trying to adjust your swing on a breaking ball or change-up when the shape of the handle is resisting those adjustments. Based on the ProXR technology research, I was convinced the bat would alleviate compression forces in the hands, particularly the hitter’s bottom hand. However, my biggest question was, are we sacrificing performance to be safer? I think the ProXR technology, although safer, will sacrifice some performance. All swings for the baseball hitting drills for contact experiment were taken off the tee. CLICK HERE for the Google Drive excel document with all the Ball Exit Speed (BES) readings and calculations. 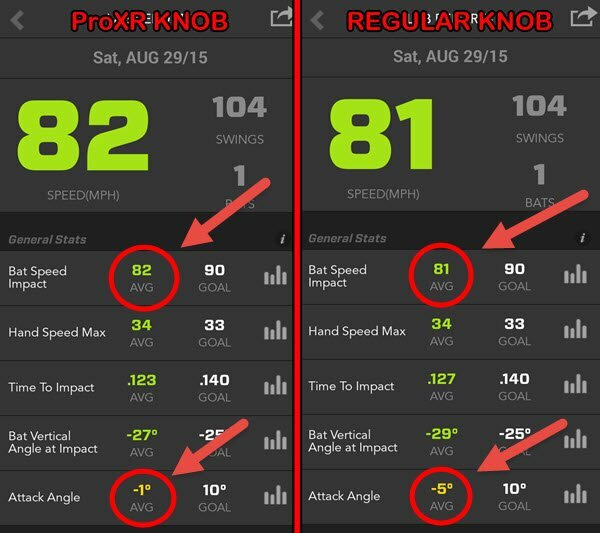 Therefore, we deleted 3 mis-reads from the ProXR bat knob data, and averaged all ProXR BES readings to 97 swings. Also, we deleted 2 mis-reads from the regular bat knob data, and averaged all regular bat knob BES readings to 98 swings. “Regular Knob” were letter ‘B’. 200 total swings were completed in the experiment, 100 per test. Counter-balancing helps remove the “getting tired” and “not being warmed” up factors. Avg. 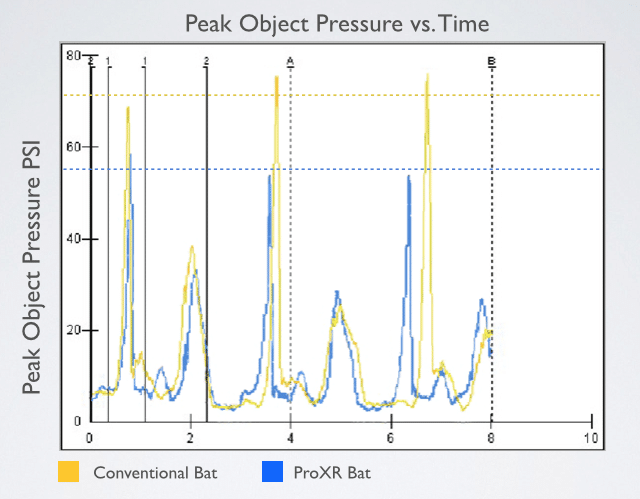 Attack Angle decreased by 4 degrees using the ProXR knob bat. Top out Ball Exit Speed was 93-mph using both the ProXR and conventional bat knob. For all 208 swings I was playing with two baseball hitting drills for contact mechanical elements in my swing: 1) squeezing the bottom three fingers of my top hand only, from the moment I started my swing (picked up my front foot), through impact. And 2) having more of a “hunched over” posture at the start of the swing. I did this for all swings, so as not to “muddy up” the experiment. The finger pressure may have neutralized the affect of the ProXR knob, since most of the “shock” at impact was taken by my top hand. Whereas a normal hitter not using top hand finger pressure would absorb the shock in the hamate bone, in their bottom hand, using the regular knob bat. Playing around with both baseball hitting drills for contact elements of #2 above, I compared the Ball Exit Speed numbers from my previous experiment looking at the difference between the Mizuno Generation ($200 bat) to the Mizuno MaxCor ($400) bat where I wasn’t using the two mechanical changes. Interestingly, my average Ball Exit Speed with the $400 alloy MaxCore was 83.5-mph and top out exit speed was 90-mph. With the wood bats, my average Ball Exit Speed was 89 to 90-mph, and my top out exit speed was 93-mph. That’s a 6.5-mph jump in average & 3-mph boost in top out exit speed using a wood bat over a non-wood!! That’s 26 more feet on average, and 12 more feet in top out distance added using finger pressure and the “hunch”! By using the two principles in #2 above, I was able to hit the “high-note” more consistently. I also had less “mis-reads” in this experiment, using the radar gun (5 total out of 208 swings), versus the Mizuno bat model experiment (18 total out of 200 swings). This is why I labeled this experiment “baseball hitting drills for contact”. After about 50 swings in the the ProXR bat knob baseball hitting drills for contact experiment, I could tell you what my Ball Exit Speed readings were going to be after each cut, +/-1 mile per hour. Crazy! Well, according to the baseball hitting drills for contact ProXR bat knob experiment data, it looks like the ProXR knob holds a slight edge in performance versus the convention knob. Coupled with the fact that the ProXR knob reduces compression forces on the hands by 20 to 25% has me convinced that ProXR bat knob technology is a can’t lose tool for a hitter’s toolbox. Joey, I’m just trying to wrap my head around all this and want to make sure I’m not making things more complicated – am I mistaken or are you showing the back pocket in the two side by side hittiing examples here and not keeping your belly button parallel to the plate? I just want to make sure I’m doing things correctly. Coach Martin, it’s more like showing the hitter’s numbers while keep the “belt buckle” perpendicular to the plate.